Free Shipping Included! 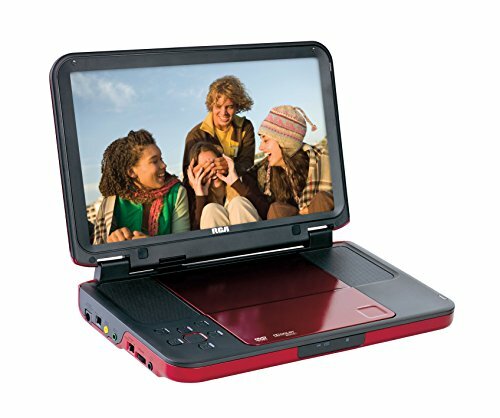 RCA (DRC6331R) Portable DVD Player - 10'' LCD Screen (Red) by RCA at Home Entertainment Centers Online. MPN: DRC6331R. Hurry! Limited time offer. Offer valid only while supplies last. RCA DRC6331R Portable DVD Player with 10-Inch LCD Watch your favorite movies away from home with the Model #DRC6331 portable DVD player by RCA. Watch your favorite movies away from home with the Model #DRC6331 portable DVD player by RCA. You'll enjoy the crisp playback of the large ten-inch screen. The built-in rechargeable battery offers three-hours of playback time - enough time to enjoy a long movie or binge watch a handful of shows. It features a built-in speaker for all to enjoy a movie simultaneously and a headphone jack for peace-and-quiet watching. Use the AV outputs to connect the player to your home TV. QUALITY: High-Resolution LCD Screen (10-inch). COMPATIBLE: Audio/Visual (AV) Input and Output ports. BUILT-IN: Rechargeable 3-hour battery and Stereo headphone jack. ACCESSORIES INCLUDED: Remote control (w/batteries), Car power adapter, and AC power adapter.